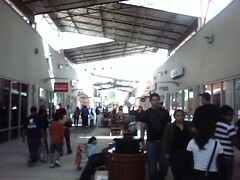 I've written on the new Premium Outlet Mall in Mercedes, Tx a couple of times. The first post was on the day when the mall had just opened. Traffic was backed up onto US Highway 83 from so many shoppers wanting to go there. The second post was recently when my family and I went to check it out. Both posts have received a lot of traffic from the Internet. I am amazed that there is so much interest. I do agree that if you are coming from Mexico and have the money available to spend on some of the high-priced brands, going to Mercedes is a much better option than travelling to San Antonio. I would go there simply to find the brands, but not necessarily to save money. In my visit to the shops, the prices were far from bargains. At least they aren't bargains like you find in San Marcos. But then, if you factor in the cost of fuel to travel to San Marcos from Mexico and the cost of a hotel, you come out even on cost and save time. For many of us in the Rio Grande Valley, the shops are simply too expensive. I would go to Mercedes again if I REALLY needed something that I could not find in McAllen and price were not a factor. Fortunately for me, my wife does not find pleasure in owning expensive brands. It's funny, but when we want to save money, we go to Mexico to shop. This is one bass-ackwards world.